While this reasoning is serviceable, it’s not always a satisfactory answer. There are a multitude of superheroes out there, they can’t all have the same reason. And what about certain circumstances, or no win scenarios? This is an easy, simple catch all, but it’s a broad statement that has a lot of faults. So let’s explore some more nuanced answers as to why superheroes don’t kill, and some counter arguments for why some actually might. Regular people don’t kill on command. This isn’t just some wide spread belief, this is a statement quantifiable enough that there is an entire field of science, killology, devoted to understanding the psychological and physiological effects that the act of killing has on people. Most species are ingrained on some level to avoid killing their own kind, even while fighting them, and humans are no different. In WWII, U.S. Army combat historian S.L.A. Marshall conducted research that indicated only about 15 to 20% of riflemen were actually firing their weapons at the enemy, and that many who were firing were not aiming to hit people. The military has had to purposefully shape their training procedures in various ways to make soldiers into better killers, by finding ways to desensitize soldiers to the act of killing (such as using human shaped targets instead of bullseye targets for practice), and to disperse the responsibility of killing over a group rather than individuals and/or onto authority figures as opposed to the soldiers. Now think about superheroes; the ultimate good guys, the people who seek to fight crime and protect citizens because it’s the right thing to do. Killing isn’t just not in their nature, their nature actively tries to prevent them from killing. And while many of them have training to better make use of their powers or to hone their skills, that training is typically self governed, and does not come from an outside source actively trying to circumvent their natural aversion to killing. Bottom line, it is actually unrealistic to think the most superheroes are even capable of killing out in the field. By the Vietnam War, the steps the U.S. Army had taken to break soldiers of their aversion to killing had paid off. A reported 90% of U.S. soldiers would fire their weapons at other people. The training was a success, and this indicates that people can be influenced to kill by training and desensitization. Superheroes who have been out in the fight for a long enough time may hit a point where killing feels like a more natural option, and this psychological effect would be interesting to see explored. Similarly, superheroes who are part of organized groups like military organizations or intelligence agencies, may have the training to overcome their natural aversion to killing. While spies and soldiers are typically portrayed as somewhat outside the mold of a standard superhero, the similarities and contrasts between them can be interesting to observe. It’s been a theory discussed in Batman stories for quite a while; that Batman had a very bad day, that it broke him, and that he’s just as crazy as the insane supervillains he fights. But the nature of his potential psychosis is one that doesn’t often get explored too deeply. This is a man who saw his parents murdered right in front of him, and his reaction was to spend the rest of his life warring on crime, the thing he saw as responsible for his parents’ death. We accept his reaction as a logical, if extreme, motivation to fight crime, but what gets frequently forgotten is how much it affects his methodology. We accept that the fear he felt as a child is part of the reason he uses his superhero persona to strike fear in the hearts of the guilty, but there’s a direct connection there to his sense of morality as well: Bruce Wayne was spurred into becoming Batman by an act of murder, therefore he sees murder as the worst of the things that he fights. We see Batman as a man haunted by his past to such a degree that this masked persona is what his whole life has become; it only makes sense that his idea of morality is definitively shaped by it as well. To some degree, his aversion to killing may not even be entirely a conscious choice; depending on how the writer wants to play it, this could be his morality as informed by his past, or this could be an emotional or psychological reaction. Now think of how many superhero origins feature the death or murder of a loved one. The number is staggering, and this is the motivating reason for these people to go out and do good. This doesn’t have to mean that superheroes are psychologically unable to kill, even when necessary, it means that if so many of these people chose to devote themselves to fighting for the forces of good because they felt the sting of the loss of life, they would also make a decision, however motivated by emotion, to not cause that same sting. This sense of empathy is frequently a defining part of superheroes, and that should not be lost. While many people react to trauma with an abhorrence of what was inflicted on them, there are people who may have the opposite reaction; with these people, the question may be asked, can they still be a force for good? One of the more interesting sections of Under the Red Hood is the reveal of Red Hood’s vendetta against Batman: Red Hood is (spoilers) Jason Todd, the Robin who had been murdered by the Joker. Upon his return from the grave, he embarks on a simultaneous assault on Batman and the criminals of Gotham. 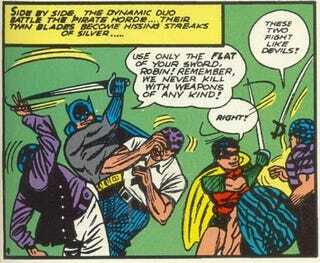 And while his methods may be more lethal and violent than Batman’s, it’s also clear that he doesn’t gun for innocents and even takes actions to curb the worst parts of crime. When it comes to his confrontation with Batman, he reveals the reason for his crusade: he’s not mad at Batman for not saving him, he’s angry because Batman didn’t avenge him. While Batman’s stated reasons for not killing follow the typical rote, Red Hood’s reason for killing is more interesting; he’s been the victim, and emotionally he hoped that his death would mean enough to Batman to make Batman kill. While Red Hood remains the villain of this piece, he would continue to develop in the DC Universe and fall right on the edge of superhero, doing quite a bit of good in the world and even later coming to Batman’s aid, even while he operates with a bit more edge than most superheroes do. He’s an anti-hero with good reason. This exploration of the good that a person can do, even when their hatred of evil means they take things, as some might believe, too far, can be fascinating, and has been at the center of a number of characters’ arcs, like Punisher or Huntress. Within the great big world of superheroes, where all it takes is one bad day to transform someone into a costumed crusader, surely there’s room for some people who can fight on the side of the angels, even if their methods are a little bit darker. Moving beyond natural instincts and psychological responses, eventually we get to the idea that certain individuals find it morally abhorrent to kill under any circumstance. The rise of pacifism, the military allowance of conscientious objectors, the growing criticism of the death penalty itself; many, many people object to killing, and even while they actively seek to help others and to stop crime or villains from causing mayhem, death, and destruction, they would still refuse to actively kill. There is a lot of room for storytelling here, from how these people came to this conclusion, to how these people ensure that they do not kill in the line of duty. This is a seriously under explored type of character in superheroes, and it would be good to see more writers apply this to the characters it makes sense on, rather than the standard reasons given for not killing. People and characters are complex. There will always be dissenters to almost any opinion, and the opinion that killing is always wrong is not one shared by all people. Even a truly moral person may find situations where they believe that killing is the right thing to do, or could be the only option. This doesn’t mean that they don’t value life, but in their quest to protect life, they might recognize situations where saving one person necessitates the killing of another. When the military altered soldiers’ training to overcome the natural aversion to killing, one of their most effective methods was by building camaraderie; emphasizing the idea that soldiers aren’t killing to protect themselves, but killing to protect their fellow soldiers. People in real life volunteer to become soldiers or police officers or government agents, laying down their own lives and sacrificing their own innocence, as it were, in protection of others because they see it as a necessary evil. Fiction should represent the wide variety of ideals that real life people possess. Let’s return once more to Batman. Batman may have a very friendly working relationship with the police, but he is still not one of them. He operates outside of the law, and that works out pretty well for everyone because he can do things the police can’t. That’s the beauty of their relationship. But it also comes with a catch. If Batman is allowed to do things outside of police jurisdiction, it stands to reason that Batman must be held accountable (perhaps more accountable) than the police. Commissioner Gordon may be a state sanctioned officer, with a license to carry a firearm and potentially kill in the line of duty, but in Scott Snyder’s Superheavy storyline, where Gordon took on the role of Batman, he became something else and that license was rescinded. Even while operating with local government backing, he was not acting as a police officer, and the rules of what he was allowed to do changed. This applies to all superheroes, to one degree or another. They act without government, without much interference, without the boundaries set upon officially sanctioned crime fighters. We the audience operate on the understanding that what they do is both right and necessary, and we rely on the unstated fact that they will always be correct in their judgment, but that doesn’t change the fact that a world where vigilantes are allowed to act as judge, jury, and executioner all at once would be a very, very scary world. We have examples of real life crime fighters, includign civilians or even the police, taking the law into their own hands with lethal action. It has been horrifying. This is not something that superheroes need to emulate or normalize. Commissioner Gordon himself brings up a rather interesting point; Batman may have a firm personal rule against killing, but Commissioner Gordon does not, and neither do any of the police officers who work for the GCPD. Officers, detectives, military personnel, and government agents are not bound by by a no kill policy; the use of lethal force is sanctioned in situations where they deem it necessary. Now, they also have a lot more to answer for. Rules are in place to make sure they do not abuse this allowance, and procedure is in place to discipline if it is deemed it has been abused. They do not act alone, and they do not act without oversight. And there are superheroes who are involved with these kinds of organizations, acting with assigned jurisdiction and oversight to keep their powers in check and ensure that their actions are justified. When operating within this kind of framework, it is acceptable that a superhero would have the same allowances as a police officer or soldier. Another situation where one might kill in the name of justice is actually in the role of executioner. While superheroes don’t frequently find themselves in this position, as they typically fill a role closer to police than to judge and jailer, enough superheroes have unique roles as rulers or assigned agents of justice (Aquaman as the King of Atlantis, Terra as the Protector of Strata) that there are situations where they may be in a position to execute a criminal, and they would be perfectly justified in doing so. This is perhaps the crux of the matter. Superheroes are portrayed as strong, as powerful, as skilled, as intelligent. Whether or not they have literal superpowers, they are considered superheroes because they can do what people commonly can’t. And while they may often find themselves at odds with similarly exceptional supervillains, the point remains: superheroes possess great power, and this frequently gives them the option to find a different way to resolve the situation. This applies to many if not most superheroes, and it goes back to the very first appearances of superheroes like Superman and Batman and Wonder Woman. The incredible feats of strength, of cunning, and of heroism that these characters demonstrated in their introductory comic book covers gives a sense of identity to the superhero; these are the people who can do the impossible. A truly justified kill in defense of self or others would require that the superhero be powerless to make any other choice, and that in itself undermines the basic concept of superheroes as a fictional entity. It’s easy to look at superheroes always saving the day and become blasé about it. Storytelling is inherently based on tension, and tension is difficult to create or maintain when it doesn’t feel like there are truly any stakes. A hero must be made to feel fallible in order to maintain the tension needed for their victories to be satisfactory. In that context, it is understandable that sometimes a superhero must be made to come across a truly impossible choice, and they must either make themselves kill or else allow the villain to do worse. That said, the impossible choice of choosing to kill the villain or let the villain kill innocents isn’t actually that interesting or unique of a way to create tension. If any other course of action legitimately is impossible, of course the good guy is going to choose to save innocent lives; they’d be kind of a terrible hero to do otherwise. Impossible situations where the hero’s hand is forced to do something are actually rather boring, because the end result is already outlined from the start and the only tension is in how long it takes the hero to accept it. Tension may be an inherent element of storytelling, but so is the subversion of expectation. When the situation is made to look impossible, that’s exactly when the hero is meant to find a way out. That is far more satisfactory. Police officers, security guards, jailers, soldiers, agents, spies, bounty hunters, space marines, warriors; there are professions, frequently pursued by noble or heroic figures, where an individual would be expected to be willing to kill. Arguably, these professions fall outside the realm that we typically classify as superheroes. But superheroes got where they are today not by being one genre, but by adopting bits and pieces of all genres, and blending them into their own unique thing. While no kill policies may have become ingrained in our pop culture subconscious as being a hallmark of superheroes, the genre is broad enough to accommodate a number of different opinions and stances on the matter. Even when superheroes still choose not to kill, they need not make that choice for fear of being no better than their villain, they should make that choice for the variety of reasons that real life people make that same choice. After all, aren’t we all just stories in the end?